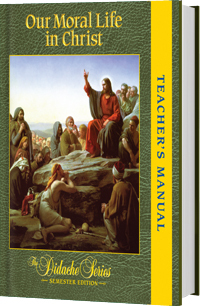 This Teacher's Manual is designed to help the instructor actively engage students in discussions, activities, and reviews that investigate the moral teaching of the Church and ways to apply it to the Christian life. It is a companion to the textbook Our Moral Life in Christ (Semester Edition). The textbook, Our Moral Life in Christ, corresponds to Book VI: Life in Jesus Christ in the curriculum framework.